The Mets are a vase fallen from a high shelf and shattered. The way the team handled the departure this week of General Manager Sandy Alderson, who is taking a leave of absence to focus on treating his cancer, underlined the club’s broken nature. It is in hot pursuit of the worst record in the National League. They have lost 44 of their last 65 games and were only 1.5 games ahead of the Miami Marlins, a team that is striving to lose every game possible, entering Wednesday. The team’s crown prince, Jeff Wilpon, who shies from reporters as a horse from an electrified fence, showed up at Alderson’s news conference on Tuesday. Often reading off a written statement, looking ill at ease, he offered a reckoning with his broken-down jalopy of a team. Wilpon left a triumvirate of Alderson deputies in charge, though he retained the final say on any decisions. Ancient Rome’s government featuring two consuls lasted for centuries, but it led to rivalries and the occasional knife in the ribs. A triumvirate is more confused still. The Mets are about to enter a fateful month in which someone — the owner, or an office temp, perhaps — must decide how much of this team to dismantle before the trade deadline. To trade either of the Mets’ aces — Jacob deGrom, who might be leading the league in wins if he played on a team that hit even occasionally, and Noah Syndergaard — strikes me as inadvisable. A staff ace is a rare bird, and holding two is the Mets’ only known competitive advantage. Whoever makes that roll of the dice should have a clear vision of the road ahead, and the gumption to see it through. As the triumvirate takes inventory of their laments, they must consider how broken the franchise is. Alderson this past winter hired Mickey Callaway, who had a fine pedigree as a pitching coach for the Cleveland Indians. But he’s been saddled with an aging starting lineup. To his credit, Alderson was brutally honest in taking his leave. Asked about the players he signed last winter, one of whom has already been cut loose, he said: “Not one of them has performed up to their expectations, or probably ours.” Alderson was quick to note that he most likely had not earned the right to return, either. The Yankees (Trust me: Having spent my boyhood riding the 7 train to Mets games, it is painful to invoke success in the Bronx) have rarely hesitated to write seven, eight and nine-figure contracts to contend. They have also embraced analytics and traded with swashbuckling daring in search of a team capable of winning 100 games. The Mets, the perpetual kid brother sprinting to keep up, insist they, too, dig analytics. This winter they claimed to possess vaults filled with launch-angle spread sheets. Then you inquire after their goals and they mumble that perhaps 85, 87, 88 wins gets them to the playoffs. Aim low with a Zeppelin and you hit a water tower. To gauge the current state of this team, I ventured with my sons to Citi Field last weekend for a clash with the Los Angeles Dodgers. Somewhere in the middle of the eighth inning on Saturday our debate commenced: Should we stay or should we go? To understand how unprecedented this was, you must understand my sons are Mets dead-enders, the sort who annually forecast a World Series trip in March. But the Mets were trailing, 8-2, and we were count-the-pigeons-perched-on-the-light-poles bored out of our minds. The Mets have achieved that unholy trinity: Bad, hopeless and dull. They don’t run. They rarely hit. They seem to obey religious injunctions against bunting and stealing bases. On the rare occasion a Mets player finds himself on first base, he can be counted to proceed at a genteel pace, if at all. 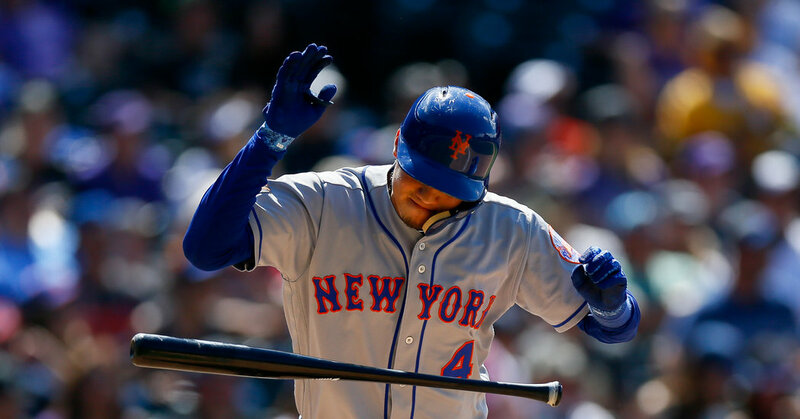 In the fifth inning, with the Mets down by 3-2, Brandon Nimmo reached third base with no one out. He’s a fast kid and game for fun: A perfect time to have a batter lay down a bunt and send Nimmo home and vaya con dios. At least it might stir the stuporous crowd. The coaches had Nimmo stand motionless as the next two batters struck out and the third grounded out meekly. A few innings later, the Dodgers pulled a squeeze bunt at the plate. The run scored and Robert Gsellman, the Mets relief pitcher, appeared rattled. A few pitches later he gave up a grand slam. The next day, Callaway was asked after yet another loss why Dominic Smith, the Mets’ young prospect, had not bunted despite having a wide open infield in extra innings. Smith, the manager replied, had never bunted in his professional career. That piqued my curiosity about the quality of the Mets’ finishing school. Despondency is the reserve of the major league club. Of late, hopeful writers claim to divine hope in one of the Mets’ odder projects. Alderson signed Tim Tebow, a failed professional quarterback, a couple years back, although he had not played baseball since high school. He’s a charismatic evangelical, and he helped increase attendance last year at the Mets’ Class A affiliate in Columbia, S.C.
Reporters from USA Today and the New York Post recently claimed Tebow is “proving he belongs.” I have reasonable eyesight and I see a soon-to-be 31-year-old man who is hitting .256 and ranks sixth on his team with five home runs in Class AA Binghamton. I wonder if the time spent helping Tebow learn to hit a curve ball might be better spent teaching Dominic Smith how to bunt?